iDancehallReggae.com::Caribbean Lifestyle Media::: Shaggy & Friends: Charity a success! Shaggy & Friends: Charity a success! 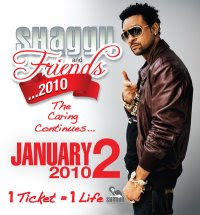 Caribbean Lifestyle Media-Shaggy & Friends charity event kicked off on January 2ND, 2010. Earlier we reported that Flow launched a channel with Shaggy to highlighted the artistes that were involved with the project. The concept was 1 ticket= 1 life. It is reported that the event was a huge success. Shaggy launched a website to help facilitate overseas participation-website can still be accessed here. The likes of Machel Montano, Busy Signal, Cham, Tanya Stephens all showed their support to this event. The masters of ceremony was miss Kitty, Squeeze (Link up Radio), Ity & Fancy Kat, and Paula-Anne Porter Jones. upon which to fight them. Saturday night's Shaggy & Friends' show was one of those occasions. benefactors and all in attendance who were offended by my performance. answer his call whenever he reaches out.